Hello all! You all know the deal. 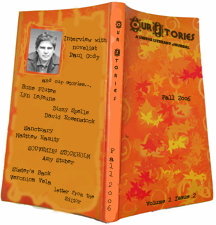 It's Thursday, so it's time for another Literary Magazine in the Limelight. Take a look. What: An online Literary Journal "committed to publishing the best fiction on the web. In each publication, you’ll find new stories, a letter from the editor and an author interview in our Interview with a Master Series." The best part of this magazine is that they give feedback on your writing. They will tell you about their impressions, what you can do to fix your work, etc. AND it costs NOTHING to submit! They also have contests and you can pay for their writing workshops (you basically choose one of their one-on-one workshops and you also have the choice of a staff member). Where: On-line. You can read stories published by the magazine online and find their submission guidelines. When: Contest submission times are held during summer, fall and winter. See the website for official submission dates. Why: Besides the fact that the magazine publishes quality fiction, the feedback on your writing is worth submitting alone. That way, writers are able to recognize what went wrong. Don't forget about the Black Fox Literary Magazine Fiction Contest. Good Luck and Happy Writing! Thanks for the info, girlfriend :) This seems like a really cool lit mag, too. Great job of plugging our lit mag in there at the end, too!